A unique spiral structure encircling dying star R Sculptoris has been captured by scientists for the first time. The spectacular picture is one of the first to come from the world’s most expensive ground-based telescope which produces images ten times sharper than Hubble. It was built to study molecular clouds like the one around the red giant R Sculptoris which is 780 light years from Earth. At 16,000ft up in the Chilean Andes the Atacama Large Millimeter/submillimeter Array (ALMA) is also the highest such machine on Earth. The Atacama desert was chosen for its dryness and clarity. 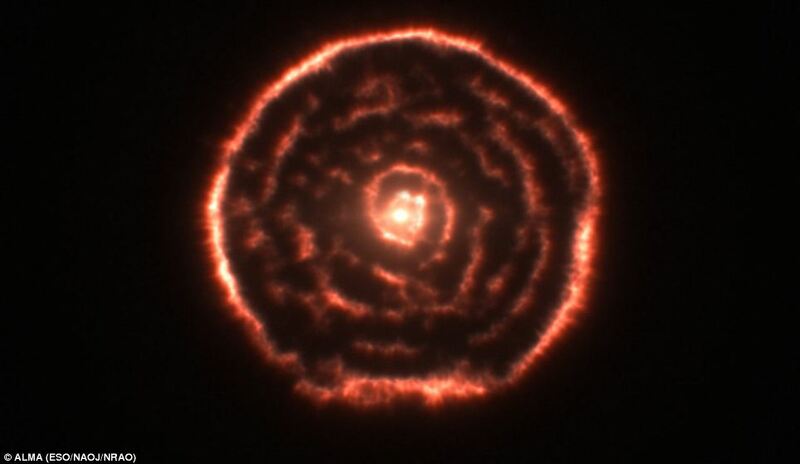 The old red giant star R Sculptoris sits at spiral’s centre, ejecting dust and gas every 10,000 to 50,0000 years to form a shell of surrounding material. Spherical shells have been seen around red giants before, but this kind of spiral is unique. It is believed it is was caused by a previously unseen companion star carving through the material as it orbits.